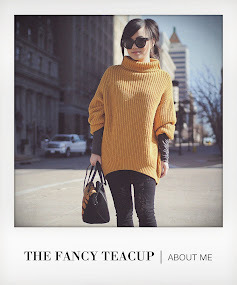 the fancy teacup: happy golden days. It is almost Christmas time! I am always so lighthearted at this time of the year. Snowflakes become the new confetti, red and green are the hottest colors of the season, gifts appear under Christmas trees like fresh grown flowers, yuletides commence, and caroling symphonies fill the winter air. Despite the hustle and bustle of holiday shopping, dinner preparing, and constant traveling, I would have to say that limited edition flavors, dazzling multi-colored light bulbs, and the abundance of cheer compensates for all that. How many of you are like me and have your hearts aglow during this festive season? You look so darling. Love the sequin clutch! What a fun and festive outfit! I love your take on the traditional holiday colors. The holiday season makes my heart happy, too! Hope your holidays are wonderful! I can't decide what I like the most about this post, your outfit or your words, I'm all about Christmas! Love the sequined clutch, gives the look a cute holiday touch! I love the subtle Christmasiness of this outfit. The dark green and the pretty color of your shoes goes really nice together. Love this look so much! The color of your top is wonderful. And those heels are perfect with it all. Love it! I'm getting so anxious for Christmas too!! That is just the prettiest little top. I love the red, green and gold in your outfit. Perfect for the holidays! I'm obsessed with your sequin clutch! So perfect for the holidays. cute!! those shoes are adorable and that clutch is on my list! Adore the blouse & I have the same clutch, so of course I love!!! lovely, like so much the blouse! The touch of gold is clever. Love the jewel tone warm colors of this look. That clutch is major! Gorgeous shoes, and I love love love your clutch! I really like the color of your blouse! I've got the same bag, and I love the outfit you created! :) I really like your style, already following you! I love the platforms even more because they look comfortable! Your outfit is gorgeous - especially the cute wedges! You are so pretty and I love your look! Amazing shoes! Great outfit.I love the way you have styled it with those shoes. Continue enjoying your holidays sweetie! Gorgeous outfit! I love the heels! I have had my eye on that Zara clutch for a little while now, it's beautiful. Love your blouse too. I find this time of year very magical. Can't wait for Christmas day! Love the look, is amazing! The green blouse is amazing!! Lovely outfit! Your shoes and sequined clutch are just amazing! What a fabulous party look - so sweet yet stunning - loooove!!! We love your style here!.. Really fit on you!.. Have a great Holiday! your outfit is so sweet, i love it! I love your shoes :) U look amazing! Love the colors! And your pochette.. So lovely! obsessed with this festive jewel toned outfit!! i love the green/red/gold! Beautiful! I love the colours and that gold sparkly accessory! So perfect! This is, without a doubt, my favorite time of year. Everything is so beautiful and cheerful! I love your clutch -- bling blinggggg. Love this whole look!!! I LOVE LOVE LOVE shoes!!! Also everytime i see that clutch at Zara's I always pick it up but never bought it. look how pretty you look!! you were made for this gig. love the sequin clutch, amazing. loving loving loving this look!! Oh, my goodness! I absolutely adore this outfit! I'm not too keen or dark colors, but you look stunning in these! I especially love the gold sequin clutch and the cranberry Mary Janes! I'm in love with the blouse!! I adore this look! That shirt is very beautiful, especially the color and the little bow makes it even more cute:D The shoes have a very special color which I crave for a long time..
BTW - you look simply beautiful in this style. 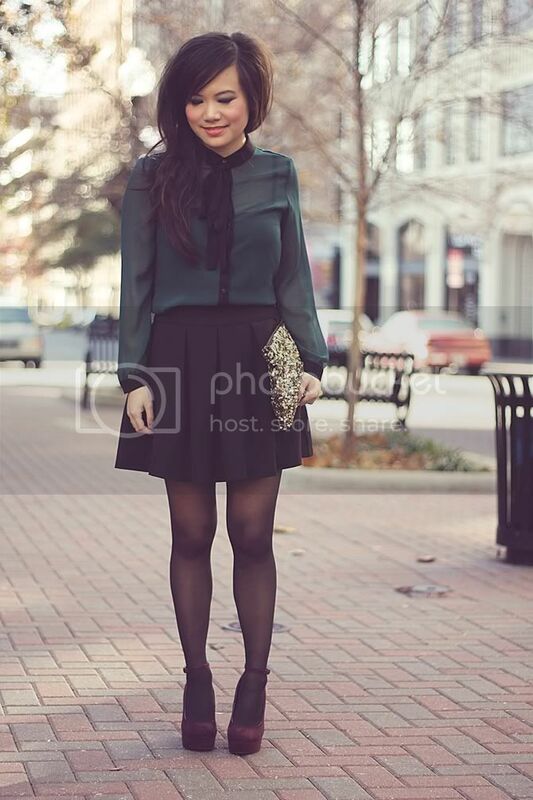 The bowtie blouse and the classic skirt are gorgeous. Helou :) Jestem Karin Marschall, zajmuję się grafiką komputerową i prowadzę Blog o modzie. Ostatnio pojawiła się na nim dodatkowa i bardzo interesująca funkcja. Otóż już dziś możesz zamówić u mnie darmowy nagłówek, bądź pełen szablon na swoją stronę. Myślę, że to co napisałam, zainteresowało Cię. Serdecznie zapraszam na mojego Bloga http://karinmarschall.blogspot.com/ >> Do napisania! I absolutely love your shoes, this is such a fabulous holiday look. Very cute! Your pumps are so cute! I can't believe their from Forever 21. I love your bag! A beautiful outfit also! You look so chic everytime I come here! I adore this look from head to toe! The colors all pop and I absolutely love the blouse. Really lovely post! We are sooo loving the F21 platforms! The color is perfection and really nicely paired with your green topper! u are lovely my dear! This is a stunning holiday outfit, you look beautiful. such a perfect winter festive outfit! the dark green, the velvety suede burgundy pumps, and some sparkle with the clutch. love it all! The clutch adds such a magical touch! love it! i'm absolutely in love with your suede heels, they are beautiful. i adore the chunkiness of the heel, the little strap and they are such a lovely colour. What gorgeous colors in this outfit! And those shoes are to die for! I really like how this outfit is festive without screaming "CHRISTMAS!!!" The gold sequins and green blouse work beautifully together. You look lovely! I'm obsessed with everything here. I love that this outfit allows you to wear shades of green and red without looking like you're going to an ugly sweater party! I've seen this gold clutch around and I think I just need to pull the plug and make the purchase! The Glitterati invite you to come enter our fabulous giveaway! We adore your whole outfit ! The amount of pussybow blouses you own must be endless! Love the sequined clutch, but I hate that everything would just automatically roll towards the middle, making it look dumpy! Christmas really is the greatest time of year! I love this outfit - it's so feminine and fun! That clutch is amazing - sparkles are a total must for any holiday look! LOVE the sparkly clutch. Such a pretty outfit. love your outfit here, so special for the holidays! I just found your blog and am loving it also! I just went to Zurich - and the city was glowing with christmas cheer, a massive swarovski tree, each street bedazzled, christmas carolers, it was amazing! amazing shoes. amazing colours ! Perfect outfit! Loving each and every piece! Love the look! It is so festive and the sequin clutch.. wow, what an addition to the outfit, coming from a person who is not a fan of sequins, you really are the reason I might have a change of heart. Thats a perfect outfit!! I have a crush on your burgundy shoes, they are awesome!!! wow! I am so happy to have found your blog! your style is so cute and classic! I love how you paired these colors in particular, its the perfect holiday look yet it would work at any other time! love it so much! I´ve seen this sequinned wallet a lot lately but I can never get enough of it. Looove it! Oh my, you look perfect! the gold adds the perfect touch!! i'm having my first giveaway, check it out. You look great and the shoes are amazing!!! I just found your blog dear, you have such a great sense of style and amazing looks. What a pretty and festive outfit! I love bow blouses! beautiful shoes and clutch, love it ! Such a pretty top, and that gold clutch goes perfectly with the green! Great post! soo cute!!! I really love your shoes!! This is such a beautiful look! I love the touch of gold! You look so gorgeous, love this! you are so beautiful girl! 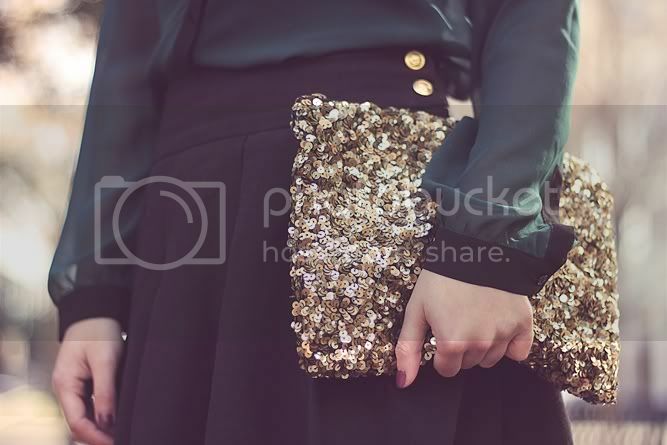 Love love love the sequin clutch :O So festive. I love the shoes, such a gorgeous colour! i love the forest green blouse and the burgandy heels! A great sense of style and amazing blog by the way. I love the top you are wearing in this spread. It reminds me of one that I found at the Salvation Army a few weeks back and modeled on my blog. Your photos are so inspiring! You have such a lovely blog with beautiful photos! Your heels are gorgeous, such a pretty plum color! Wow your outfit is so beautiful! I really love the colour of the blouse and heels!! you are such a beautiful and you have amazing looks love. I ve just seen ur blog and i am very impressed. Such a sweet blouse!! love it :) I've got the same clutch, but in silver color. It's amazing! you look awesome! such a cute ensemble! Nice blog, love your style Darling!! Amazing blog and wonderfull pictures. I absolutely start to follow you now. LOVE this look!! it's a great outfit for the holidays!! Love the sparkly bag...perfect for this time of year! Happy Holidays! I follow you, check my blog and follow me too if you please! This is STUNNING! I loveee that clutch!! I love that sheer blouse, I have a similar one in that colour. But I am lusting after those shoes. So gorgeous!! This outfit is darling! I love the blouse, and the clutch is just the perfect amount of holiday glam! Hope you have a wonderful holiday, girlie! Really amazing photos, I like them! Your heels are amazing!Great post! Cette tenue est canon ! I love your style! I love to look at your posts, they're very inspiring! Lovely look and nice blog. www.lonelyreload.com (A Growing Teenager Diary) .. Perfect outfit! The shoes and the clutch are so gorgeous! Go check my blog and follow back if you like it ! this is just such an amazing outfit! truly gorgeous:) have an amazing holiday and merry christmas! Wow - the blouse is gorgeous, I love the deep green with the gold.